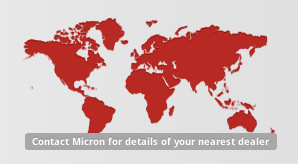 Micron AU9000 is a vehicle-mounted cold fogging machine developed specifically for the control of adult mosquitoes, flies and similar pests using both conventional and water-based ULV insecticides. The AU9000 provides excellent control of spray droplet size and flow rate of insecticide, whilst being easy to operate and maintain. It is intended for use by municipalities, pest control contractors, military authorities and similar organisations requiring reliable, cost-effective pest control. The sprayer uses a reliable 10 HP Briggs & Stratton four-stroke engine with electric start, driving a powerful 180 m3/hour blower. The two sprayheads can be independently oriented both horizontally and vertically to achieve a wide swath width and to provide optimum coverage of the target. All controls are operated from inside the vehicle cab for maximum operator safety. 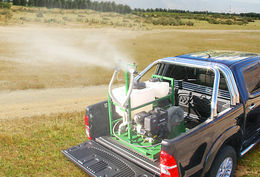 The sprayer incorporates many unique safety features, including an air pressure sensor to stop the insecticide pump in the event of the engine stopping or a failure of the blower. The flow rate of insecticide is controlled by a ten position switch on the control box in the cab to ensure precise and repeatable calibration. All pipework and components in contact with insecticide are manufactured from chemical resistant materials. The insecticide tank has a wide aperture for ease of filling and a drain valve for easy and safe emptying after use. A 10 litre flushing tank is provided to enable insecticide to be purged from the pump, hoses and sprayheads after use. The engine and blower are mounted on a rigid base frame to ensure smooth running and reliable operation, even in extreme conditions. The frame is provided with mounting holes and provision for lifting with a fork truck for secure installation and ease of handling. The AU9000 has been tested for compliance with WHO specifications.